A young girl has her photo taken during this year's Macy's Thanksgiving Day Parade. 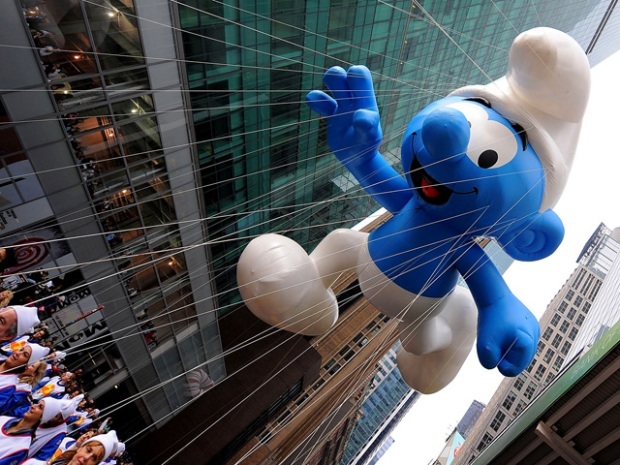 More than 10,000 performers, balloon handlers and participants made their way down nearly three miles of Manhattan streets this morning -- avoiding Broadway this year -- during the spectacular Macy's Thanksgiving Day Parade. Some 3-million participants lined the parade route to see old friends -- like Bullwinkle and Snoopy -- while four new balloons -- Spiderman, The Pillsbury Doughboy, Ronald McDonald and Sailor Mickey -- make their debut on the brand-new parade route. Kermit the Frog kicked off today's singing and dancing. For the first time in its more than 80-year history, the parade route bypassed Broadway as it headed south from the Upper West Side to Macy's flagship store in Herald Square. The parade began at 77th Street and Central Park West, winding down to 7th Avenue, on to Central Park South and from there to 42nd Street, eventually making its way to 34th Street and 6th Avenue. "I finally made it after 20 years!" Yussett Nabarrete of San Diego, told the Daily News. The reveler staked out a spot on Seventh Avenue with relatives at 3 a.m. "I really wanted to be here." This new route included turns around five different corners. Physics professor Brian Schwartz says the demands of the new route were more of challenge for the balloon handlers and the marching bands.